LONDON (Sputnik) – The UK Foreign Office’s spokesperson supported the US claims that the Syrian government forces were involved in the toxic chemicals attack in the city of Aleppo in November. "The Syrian regime and its supporters have alleged that opposition forces carried out a chlorine attack on civilians in Aleppo on 24th November. We have seen nothing to support the claims made by Russia and Syria. The UK assesses it highly unlikely that chlorine was used in this incident, as the regime and its Russian allies have claimed. It is highly unlikely that the opposition was responsible," the spokesperson said in a statement. The statement suggested that the attack in Aleppo was a staged incident aimed at framing the Syrian opposition forces or was an operation that when wrong, and which Moscow and Damascus sought to benefit from. "We frequently see the Syrian regime and its partners making false claims and using disinformation to cover their tracks. Allegations that the UK or its allies are in any way involved in this, or any other incident involving chemical weapons in Syria, are complete fabrications," the Foreign Office argued. On Friday, the US State Department spokesman, Robert Palladino, said that the forces of Syrian President Bashar Assad and Russia falsely accused the opposition and extremist groups of conducting a chlorine attack in northwestern Aleppo on November 24. 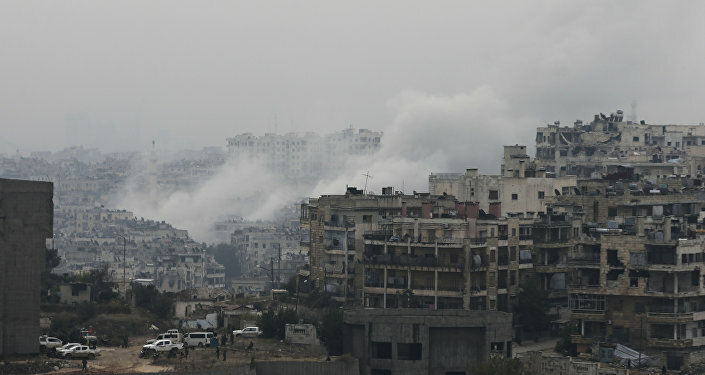 Palladino added that that Washington had credible information that pro-Assad forces had allegedly used tear gas against civilians in Aleppo on that day. The Russian Defense Ministry said it did not rule out that the US allegations on the Aleppo incident were aimed at diverting the public attention from the US aviation’s deadly crimes in the east of Syria. The spokesperson noted that London continued to work closely with its allies "to establish more fully exactly what happened." The Russian military has said it had an undeniable proof of the recent attack in Aleppo. The Defense Ministry has suggested that the US claims on the recent chemical weapons incident in the Syrian city were an attempt to whitewash terrorists and the White Helmets group, affiliated with them. For months, the Russian Defense Ministry has been warning that Syrian militants and the White Helmets were planning to stage a false flag chemical weapons attack in Syria to frame Assad's forces and draw western retaliation against the Syrian government.